Would you believe me if I told you that, until a few days ago, I'd never before played Luigi's Mansion? Honestly, I can't tell you why I avoided this GameCube launch title all this time. I have a feeling it had to do with its rumored lack of length. (I've heard the game can be completed in just a handful of hours.) Another possibility: I was turned off by the fact that it wasn't a proper, Mario-centric platformer. Whatever the reason, Luigi's Mansion failed to find its way into my shiny silver GameCube until now. As for what prompted me to change my mind about this title and add the copy seen in the photo on the right to my collection: I'm going to blame it on all of the videos of the fabulous-looking 3DS follow-up, Luigi's Mansion: Dark Moon, that popped up after E3 2012 (many of which have been watched over and over again by yours truly). Actually, I shouldn't say "blame," as I'm really enjoying Luigi's Mansion so far. It took me a few minutes to come to terms with its controls, but since then I've had a blast. I especially like how Luigi's vacuum affects pretty much anything in its path: Hanging clothes, chairs, tables, vases--you name it, this little sucker reels them in (or at least attempts to) like so many fish. I also really like this game's atmosphere. It's spooky, but silly, too. And the soundtrack? Subtle, but also oh so sweet. I especially get a kick out of how Luigi hums along with the main theme. 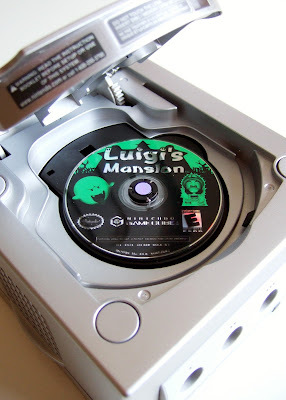 Have any of you played through Luigi's Mansion? If so, what are your thoughts on it? And are you looking forward to the sequel, or was one spooky Super Mario Bros. spinoff enough for you? Yes, it's short (can be completed in about four hours if I remember correctly) but that shouldn't detract from what is a great little game. Hey there, dste! Good to hear some other folks like this game, too. If the bit about four hours of play time is true ... woof! I can understand some of the complaints against this game, in that case -- especially since such short games weren't as common back then as they are now. That said, it's clearly a well-made game, and I'm really enjoying it so far, so who cares about the length? I have a huuuuge soft spot for Luigi's Mansion because I really love the idea of a Mario series game that takes a character completely out of their element and really pushes it. Like, not only do you have Luigi in a haunted house (woooOOooOOO), but it's a closed area that you explore over the span of several nights. The mansion is like the exact opposite of the Mario series' bountiful open-air areas, but it's still about movement and how to navigate each screen (the hard part of sucking up the ghosts is managing to keep your footing and follow them around while you do it). Maybe this is just me, but I actually wish that the game was just a liiiiittle bit scarier. Just a little bit more sincerely unsettling! It's a great game Bryan. I'm not surprised you are enjoying it. It's also short but that didn't stop me from enjoying it when I played it. Actually, I've found that I tend to enjoy shorter Mario games. That could be why I liked Luigi's Mansion (and now Super Mario Land 3D) so much. I think the original caught a lot of flak it didn't deserve. I always looked at it as a game to highlight just what the Gamecube could do. It certainly makes a better intro to a controller and a technological jump better than Wii Play ever did. I'm eagerly anticipating the sequel. Frank: Yeah, shorter games aren't always worse than longer games, are they? Hell, as an adult, I sometimes think "the shorter the game the better," as my poor age-addled brain can't seem to focus on longer games as well as I used to. The only time I like playing as Luigi is in Mario Kart 64. Justin: Don't get me wrong -- I've long WANTED to play Luigi's Mansion, and it sat on my Amazon wish list for ages, but I just never got around to actually buying it. I always loved the aesthetics of it, though, and that's one of the main reasons I've been so stoked about the upcoming 3DS sequel, which actually looks quite a bit better than the GC original to my eyes. BTW, I wouldn't be at all surprised if the flak you mentioned was part of the reason that I avoided the game for so long. I probably got caught up in the "but it's not a proper Mario game!" whinefest and also was turned off by its lack of length. Nice find. It's the only Gamecube title I'm still looking for and I don't know why I never picked it up. Ah, I'm not alone then! Yay!! Considering how much I've enjoyed it so far, Retr0gamer, I think it's safe to say you will enjoy it, too. So, go pick it up sometime soon! I liked the game for a good bit but I had to give up near the end. There's some boo fetch quest that takes a lot of patience. I got everyone one of them except this one boo that kept flying between a room and a hallway. Making him really hard to catch. Ah, fetch quests are the worst, aren't they, Adam? I didn't realize this game had any. I guess I'll find out soon enough -- hopefully this weekend. As such, I'll let you know if I find it as annoying as you did. Hey there, Chalgyr! You know what I really like about the game so far? How wonderfully the whole thing is constructed. It's like you're running around in a spooky dollhouse or something (and I mean that in a good way). That's one major reason I'm really looking forward to the sequel. One of the things the 3DS does so well is make the games you're playing look like dioramas, and the GC version of this game already looked like a diorama so how can they go wrong with the follow-up? Luigi's Mansion is one of my favourite video games on that generation. People rag on it's length, but I like the idea that I can sit down and conquer the game on a free Sunday afternoon. A true gem. yay! you're finally playing Luigi's Mansion! Have you seen this video http://www.youtube.com/watch?v=kvpZRbV0EuA&hd=1 ? I WANT IT NOW! Also I want that ringtone at around 0:54 mark!!! I hadn't seen that particular video before, Igor, but I've seen a lot of others. It sure looks great, doesn't it? Release it NOW, Nintendo!! I haven't played it myself, as I never owned a GameCube. I might pick up a copy now that I have a Wii, though! As for you picking it up, too: I really have a feeling you'd enjoy it. It's certainly a unique game, and so charming. Luigi humming along with the main theme (as you wander about the haunted mansion) gets me every time! It's great! I wait for the next Luigi Maison! I will never understand why Luigi's Mansion got so much negative press. Big whup, you don't get to play as Mario. The game was a great GCN launch title and still looks impressive to this day. I was very excited when I heard this baby was getting a sequel, which I cannot wait to play. I also need to replay the original. Hey there, Reggie! Yeah, you'd think people would be excited to get something other than a Mario game once in a while, right? Anyway, screw the haters, I say. Like you said, the game is great, especially in terms of its graphics. And the 3DS sequel looks even better!